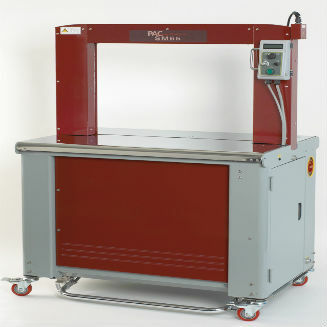 These machines come in arch models and can be fully automated, they are set up something like a desk, with the sealing occurring below the “desk” panels, making them ideal for waist-height conveyor systems and fast-paced strapping processes. • Easy strap access—no tools necessary! This also comes in a fully automatic model, the SM65-FA, which boasts additional features, including simplified strapping head, hinged top plates for easy maintenance, multiple strap patterns, and adjustable conveyor speeds, to name a few. The SM65-FA requires no operator and utilizes sensors to place your strap in the proper location, every time. The fully automatic version, the Auto PAC 300-FA, provides additional features while still being affordable. These include adjustable photocells, a variable conveyor speed, and simpler controls. The Auto PAC 300-FA requires no operator and utilizes sensors to place your strap in the proper location, every time. And, of course, numerous other applications depending on your industry. The exact use will determine the strap type and arch size you will want on your bottom sealing strapping machine. 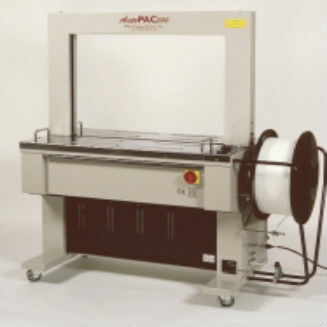 To learn more about our strapping machines and their applications in your industry, contact PAC Strapping Products today.